As professional Correx printers, we are capable of producing both personalised prints and standard Correx boards. Having provided Correx printing in Nottingham and throughout the surrounding areas for a number of years, we have developed a well-known reputation for the quality of the Correx prints we produce. All of the Correx printing we carry out is with high quality inks and materials to ensure we achieve the best possible Correx print finish. When it comes to needing a Correx printer in Nottingham, be sure to order from CRS Graphics. 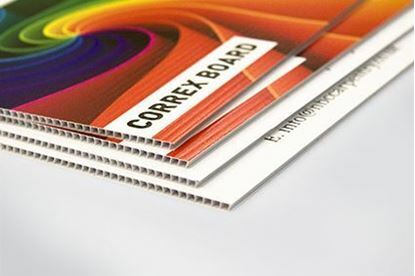 Printed Correx boards are used by a number of individuals and businesses for everything from selling to promotions and much more. The finish of the Correx prints, makes them suitable to be used both indoors and outdoors. When it comes to Correx boards and prints, we can use your own artwork or we can create a design for you. Our printed Correx boards are designed and manufactured to some of the highest industry standards. With multiple customisation options to choose from such as size, thickness, sides and much more, you can create the perfect Correx print to suit your requirements. If you’re in need of Correx prints in Nottingham or any of the surrounding areas, be sure to order form CRS Graphics. We have years of experience dealing with Correx and our team always go the extra mile to ensure we achieve highest possible standard of Correx printing. Whether it’s a customised Correx print your need or standard Correx boards, then CRS Graphics have you covered. If you have a specialist order and aren’t wanting to place it online, the simply get in touch with CRS Graphics and one of our team will be more than happy to help.